Friday around 5 lordaerith and I left to go visit queencimmy at SLC. We got there with almost no hassle at all. With Aerith's help I was actually able to SEE the sign to turn onto the 3rd highway for unlike last time. We got there and ended up waiting for Cimmy and her suitemate, Pirate Wench (so called b/c of her obsession w/pirates and the fact that she spent a semester at sea), for about half an hour before I finally called them to see what was up. They thought we were getting in a little later than we did. So, we went back to their suit, which is in a dorm called "Titsworth" *giggle*. After hanging out for a little bit and finding out that Pirate Wench and I are too alike for our own good, we went to see Secretery b/c neither of our hosts had seen it and well, Aerith and I really like it. Saturday morning we got up early to go to the Faire. The drive there was pretty easy and painless, except for the time I didn't see the break lights ahead of me (i was looking at road signs) and so had to hit the breaks really fast. Yay for good breaks, boo on squeeling tires and the smell of burnt rubber, but at least I didn't hit anything :). We got to the faire a little later than we wanted to (we wanted to make it for opening, oh well) and it was kind of drizzly out. We changed into garb (all nice and laced up) and went in. Oh, and honey, I don't need to use my hands get this look. 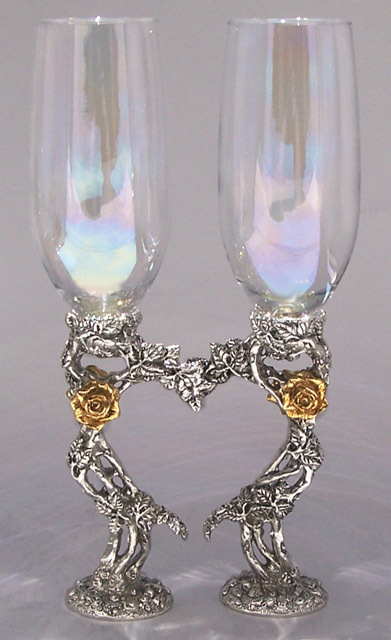 Aerith bought some bracers (which I thought were to keep his sleeves out of his food, but were really to keep them out of the way of the ring) and a pouch from this leather store and we saw these really pretty pewter goblets. The woman selling them said that they were good for weddings, and I showed her my hand and said "do you see a ring?" Little did I know what was to happen later that day. We had soup bowls for lunch b/c by the time we were hungry we were also very cold and the rain had soaked through part of our cloaks. After lunch we went by Moresca and Cimmy tried on a full outfit. After we all rested we were like "let's go take pictures at the Kissing Bridge." Well, you know what happened there. Aeirth proposed. I was so happy. I really couldn't believe it happened. I think the first thing I said, after "yes", was "is this for real?" And I have to confess, I made Aerith write down what he said. Once he got on his knees, I heard what he was saying, but it wasn't registuring b/c I was so happy and was in such total shock. We walked around some more and made more bawdy jokes with the pickle venders and the guy selling frozen balls of strawberry and orange flavored ice. We saw a live action chess game, but it sucked a lot and was no where near as cool as SSFFSs ever are. Then we ran into witch-child and her mother (who we used to game with) and DJ P from Haven. And there was more ring showing. After that we were tired and soaking wet so we decided to leave, but not before Cimmy bought Aerith and I the glasses that we had been looking at earlier. I got to show the woman that i had shown a hand with no ring the same hand now with a ring. After that we left and Aerith drove back to SLC. I called my mother along the way. She knew it was going to happen. After getting back and calling a zillion people, I found out that a lot of my friends knew it was coming, so did my tartot cards even, but somehow they all kept it secret from me. Then we went to this "block party" thing at the Pub. Free food and getting to show off my ring, yay! The music, while oldies, which i love, was way too loud and once again I discoved that I just can't dance to it. I'm so happy. I can't believe it's finally happened. We've been dating for almost 5 years now ;) Tonight wild horses couldn't keep me away from Haven.